Why Does San Diego Have Such Bad Air Quality? There is a lot of discussion these days about climate change. Global warming. Carbon emissions. The Climate Action Plan. You no doubt have friends talking about going electric, or who are proud owners and drivers of electric vehicles. Or friends or family members who devoutly bike everywhere. You may know some folks too who use public transportation. The majority of San Diegans are dissatisfied with public transpiration. San Diegans prefer cars — it’s our way of life. Not necessarily across the board — many satisfied bus riders in OB take the 923 bus downtown for work and are quite satisfied — doing work, reading, or playing games on their bus ride. Many people do use public transportation and are satisfied. But we have by no means reached an efficiency of public transportation comparable to New York City, San Francisco, Berlin or many other large cities. If public transportation does not genuinely get people from point A to point B in an amount of time comparable to driving or more quickly than driving — public transportation will likely not grow to be more popular in our city. Anyone who has spent an hour or longer by bus and trolley getting somewhere he/she could drive in 20 minutes has likely lowered his or her opinion of San Diego’s public transportation — and has been less eager to use it. Even individuals hopeful to utilize public transportation grow frustrated with it in San Diego. We as a city are dissatisfied with public transportation and we are also facing the effects of climate change on top of having horrible air quality (which may be a surprise to some people). Most San Diegans think of our city as having beautiful beaches and lovely, clean air. We think of our neighboring smoggy city of LA with disdain. But we aren’t that far behind. If we don’t make some changes, it certainly isn’t going to get better. And WHY is our air quality so bad?? For starters California as a whole is not doing well in air quality studies and several cities in California are among the top 25 worst cities for air pollution in the country. Los Angeles, which is not that much of a surprise, is the worst in the country. California cities dominate lists for the most polluted areas in the nation for ozone (smog) as well as short-term and annual particle pollution (soot). The majority of emissions come from mobile sources, including on and off road diesel fueled-vehicles, cars, trucks, buses, locomotives, ships and aircraft. Ports and goods movement in the border areas contribute to local and regional pollution. Transport of particles from Mexico into Imperial County is a source of pollution. Area sources including smoke from residential wood burning contribute to pollution. In addition to local sources of pollution, San Diego and Imperial counties face challenges due to the transport of pollutants from the South Coast Air Basin to the north and from Mexico to the south, particularly El Centro. Much of the information about air quality studies can be found in the American Lung Association’s “State of the Air 2016” where San Diego has an F ranking. Trend charts, rankings, regional fact sheets, and maps are available here. The full 157 page document of the “State of the Air 2016” can be viewed here. For 17 years, the American Lung Association has analyzed data from official air quality monitors to compile the “State of the Air” report. The American Lung Association’s 2016 report grades U.S. counties on harmful ozone (smog) and particle pollution (soot) recorded over a three-year period, and details trends for metropolitan areas over the past decade. The report ranks both the cleanest and most polluted areas in the country. 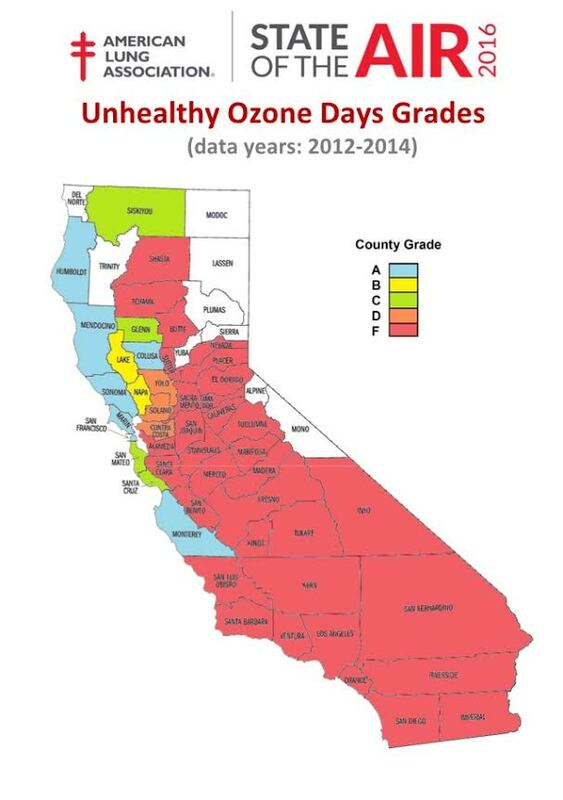 While the “State of the Air 2016” report shows progress for California, it serves to remind us of our struggle to breathe healthy air, as more than 80 percent of Californians live in counties affected with unhealthy air during certain parts of the year. Climate change is a growing threat to air quality in California. Drought weather conditions and wildfires related to climate change are contributing to elevated levels of particle pollution in some areas of the state. Key sources of soot include wood burning devices, transportation sources such as diesel engines in trucks, buses and freight, and smoke from wildfires. Soot particles are so small that they can lodge deep in the lungs and trigger asthma attacks, heart attacks and strokes. In San Diego and Imperial counties, more than 500,000 residents have asthma, including 69,000 children. So what is our future?? I recently had the opportunity to meet with Debra Kelley, Advocacy Director of the American Lung Association of San Diego. As we discussed pollution, San Diego’s air quality statistics, and public transportation — two things were very clear. Many cities in California, including San Diego have very bad air quality. And secondly, the American Lung Association encourages the use of electric vehicles. To decrease smog and improve air quality — go electric. Increase zero emission vehicles and fuels, including passenger vehicles and freight. Support clean air investments through the Greenhouse Gas Reduction Fund. Coordinate efforts to assist with cross-border pollution that impacts air in the region. Reduce climate pollutants, including methane and black carbon. Plan healthier communities focused on walking, biking, transit and zero-emission transportation options. The American Lung Association has focused its advocacy for this election on Proposition 56. The American Lung Association encourages a “yes” vote on 56 (an increase on California’s cigarette tax by $2 per pack, with an equivalent increase on products containing nicotine derived from tobacco, including e-cigarettes). I can’t help but think that a “yes” vote on Proposition 56 would also help our suffering air quality and would help to improve the health of many humans with a potential decrease in the sale and consumption of tobacco. Measure A — also on the ballot for November — proposes $18 billion worth of changes to our transportation infrastructure in San Diego. Among the proposed changes in Measure A are an additional trolley line (which would be called the purple line), additional bus routes, and additional freeway lanes and routes. Business as usual — buses, trolley and freeways. Would any of those changes genuinely get people driving electric vehicles, genuinely speed up the rate of getting from point A to B on public transportation, or genuinely get people off the road? Would adding a trolley line really get people out of their cars? Would a few more bus routes likewise get people off the road or driving electric? If a person still has to travel 30 minutes to an hour by bus and/or walking to get to the trolley or bus — their preference may still be to drive. Would additional lanes on the freeways get people off the road or driving electric?? Or if traffic flow were improved by additional lanes and connecting routes on the freeways — that would likely put more people on the roads. To improve or at least maintain our air quality — it seems that more than a new trolley line, more than some added bus routes and freeway routes — need to be addressed. Opposition to Measure A additionally points out the impact on public health caused by pollution and freeways. Specifically low-income communities and communities of color which are most likely to suffer from air pollution due to their proximity to freeways. Air pollution from cars is linked to cancer, asthma, cardiac diseases, and many other harmful health effects. Opponents of Measure A say that it does not even begin to address San Diego’s air quality issues and threatens public health while doing nothing to create real solutions to address the region’s transportation needs. San Diego recently committed to getting 100 percent of its energy from clean and renewable power sources with a Climate Action Plan that sets the boldest city-wide clean energy goals in the U.S. Increasing the use of electric vehicles will help slow down climate action change as well as clean up the air. The emphasis made clear by the Climate Action Plan and American Lung Association needs to be going electric in our car dependent city. And not much in Measure A is promoting a movement towards electric. To address the challenge of air pollution and climate change, the American Lung Association in California and major health and medical organizations urge the public and policy leaders to strongly support the federal Clean Air Act and the federal Clean Power Plan as well as California’s strong clean energy and clean air policies. This year the lung association is also calling for support of Senate Bill 1383 (Lara) to set clear targets for reducing “super pollutants” like black carbon from diesel exhaust and wood burning that threaten public health locally and are accelerating climate change. Now is the time to transition from fossil fuels to zero emissions solutions. Not much in Measure A is advocating that transition. And that would be $18 billion worth of a plan that is not environmentally sound and not helping to improve the state of our air. Too bad the DECO program has so many snags. Then again, if the purpose of incorporating it is to get more people out of their cars, wouldn’t that largely be comprised of people who already own bikes? Container ships which transport the majority of our consumer products thousands of miles have the dirtiest burning fuels available. Ninety percent of our products arrive by container ship. 160 of these ships create the same amount of smog and particulate pollution as all the cars in the world. The total fleet is 6000 ships. But without container ships what would happen to the global economy. China (Shanghai) owns the largest fleet of containers in the world. Maybe they will reduce it? Without cheap (fixed) labor and (fluid) capital, where would the global economy be? The whole global economy, aka casino capitalism, needs to be turn apart. It is the number one threat to the environment and people trying to make a stable livelihood across the world. Would China consider reducing the number of container ships? Not without some incentive to do so. The challenge is finding those incentives. Measure A will invest $2 billion in habitat conservation, which does a lot for climate resilience. It will provide funding to manage and protect areas against wildfires, helping to reduce the loss of life and property, and it will help protect the water quality of our rivers, oceans and groundwater by ensuring the proper treatment of toxic runoff from our roadways. Measure A raises funds for road repair, public transit improvement and traffic congestion relief – and for the preservation and conservation of natural areas. San Diego County’s communities will benefit from Measure A, so I recommend voting yes and so does The Nature Conservancy.